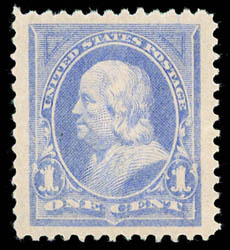 1894, 1¢ ultramarine, o.g., never hinged, precision centering amid huge margins, bright beautiful pastel color, an Extremely Fine to Superb jumbo, a remarkable large margin gem; with 2000 P.F. 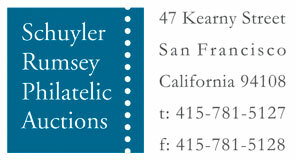 & 2005 P.S.E. certificates, the latter Graded (XF-Sup 95J, SMQ $1,500). 1894, 8¢ violet brown, right margin single, o.g., barest trace of hinge, beautifully centered amid uncommonly large and well balanced margins, bold vivid color, fresh, Extremely Fine and choice, a lovely jumbo; with 2006 P.S.E. certificate. 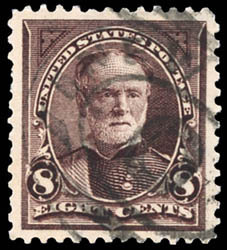 1895, 8¢ violet brown, watermarked USIR, showing large portion of "R" watermark, neat oval cancel, precision centering amid large evenly balanced margins, rich color, an Extremely Fine gem, rarely encountered in such choice condition. 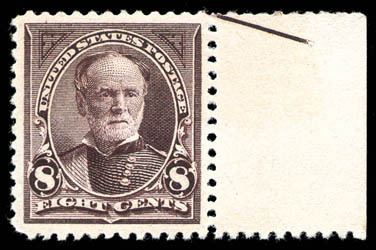 AN EXCEPTIONAL USED EXAMPLE OF THE 1895 8¢ BUREAU ISSUE WITH "USIR" WATERMARK. 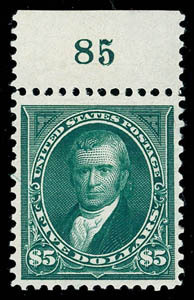 1895, $5 Dark Green, top margin single with plate number "85", o.g., lightly hinged, deep rich color, choice centering, bright and fresh, Extremely Fine; with 2002 P.F. certificate. AN ATTRACTIVE MINT PLATE NUMBER SINGLE OF THE 1895 $5 BUREAU ISSUE.